As they chase the bugs away. I'm not sure who composed that poem, but it appeared on an advertising leaflet from noted herbalist Sal Gilbertie. The poem has it right. Santolina is a very effective insect repellant. Santolina (pronounced san-toh-LEE-nah) is a genus in the Asteraceae family which also includes ageratum, asters, daisies, goldenrod, sunflower and yarrow. There may be up to two dozen species in the genus. The name, Santolina, means "holy flax", but it seems no one knows why. The plant was well-known in ancient times for its medicinal and insect-repellant properties. Flax, of course, is a plant of a different genus used for fiber. The Shroud of Turin has been called The Holy Flax of Passion, but I can find no indication why the genus bears the name. I suppose the name is lost in etymological obscurity. Native to the Mediterranean region, santolina plants are generally evergreen in mild climates. They prefer dry, poor, sandy soils, full sun, low humidity, and tolerate heat and drought very well. Santolina species have been popular as low hedges for traditional knot gardens. They are also used in wreaths and potpourri. From the Middle Ages until the 18th century, santolina was strewn on the floor as an insect repellent, disinfectant, and to cover odors. 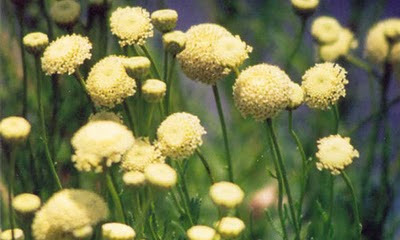 The flowers and seeds were used to treat intestinal parasites. Pliny, the Roman naturalist, prescribed wine containing santolina for snake bites. My favorite species is Santolina rosmarinifolia. Mature height is 12" to 24". It spreads in a mound shape to 24" to 48". The plant is great for herb gardens, fragrance gardens in hot, dry climates. S. rosmarinifolia is hardy in USDA climate zones 7 - 10. It prefers well-drained soil. Soil pH should range from 6.6 to 7.8. Take a soil sample to your nearest Cooperative Extension Service office for proper analysis. Follow the recommendations. Cultivate at least 6" deep, removing all traces of weeds. Compacted soil should be cultivated to 10" deep. Space plants 36" to 48" apart. Dig planting holes into the cultivated soil a little less deep than the depth of the growing container. Water the plants in the pots, then drain. Place the plants into the holes and back-fill, watering as you go. Press soil around the root balls. Do not cover entirely the root balls with soil. The tops should be slightly exposed. Add a top-dressing of mulch around the plants, not on top of them, about 1" deep. Plant santolina with other species having similar cultural requirements. It has no insect problems and few disease problems. The greatest cause of failure is over-watering. Allow soil to dry between watering. Found this when I was trying to find out WHY Santolina is 'holy flax'. Perhaps Culpepper's Herbal might tell us? Culpeper mentioned it as Lavender-cotton, but with no clue to why called Holy Flax. I thought that it might have something to do with strewing it on the floor in medieval times as an insect repellent, and was thus associated with flax, a common floor covering. But rushes were most common. Perhaps santolina fibers were woven with flax fibers (linen) to protect fabrics. I'm speculating.